ME Conferences invites all the participants from all over the world to attend 9th International Conference on Chronic Obstructive Pulmonary Disease (COPD) during October 24-25,2019 at Helsinki, Finland. This meeting deals with the advanced research technologies in the field of pulmonology and also about the new treatment approaches which are formulated by scientists to treat numerous diseases in an easier method which includes encouraging keynote presentation, Oral speech, Poster presentations, Exhibitions. The main theme of the conference is “Scrutinizing the challenges and developing novel approaches for COPD treatment”. 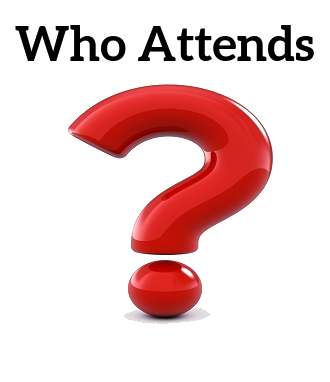 This would be a two days conference which prompts the minds of attendees. 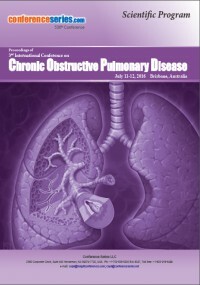 International Conference on Chronic Obstructive Pulmonary Disease aims to bring together globally distinguished academics in the field of Pulmonologists, Pulmonary specialists, Respiratory specialist, Chest medicine specialist, pediatric pulmonologists, Public Health professionals, Scientists, Academic scientists, Researchers, Intellectuals, to exchange about state of the art Research and Technologies and to bring discoveries of cancer to Patients. To understand the current state of research and the challenges to future discovery. Asthma is a common inflammatory disease in airways of the lungs. Asthma affects inside of walls of airways are swollen or flamed and causes allergic asthma. Swelling creates the airways even narrower. Cells in the airways tends to cause more mucus production. Secretion is a thick, sticky liquid that can further slender the airways. This chain reaction can result in respiratory disease symptoms and may cause allergic diseases. It is mainly characterized by reversible airflow obstruction, and bronchospasm. Asthma is classified according to the frequency of symptoms, forced expiratory volume in one second, and peak expiratory flow rate. These measures may occur a few times a day or a few times per week. Depending on the person, they may become worse at night or with exercise. Asthma cannot be cured but with better treatment, people can control and active their lives. The blockage of an artery in the lungs by a substance which has moved from elsewhere in the body through the bloodstream or when there is usually a blood clot in the lung blocks the blood flowing through an artery which feeds the lungs. The regularly recurrent symptoms of embolism are characterized by the coughing of blood, shortness of breath, chest pain while breathing in and coughing up blood. If the pulmonary embolism is large, it may be capable of such a large mismatch, the patient cannot get enough oxygen into the blood and can be become acutely short of breath. Rapid treatment to break up the clot greatly reduces the danger of death. It can be done with blood thinners and drugs or procedures. Corporal activity Compression stockings can help prevent clots from forming in the first place. Small effusions and lung cancer are caused due to smaller pulmonary emboli which tend to lodge in more exterior areas without collateral circulation they are more likely to the effects which are painful, but not hypoxia, dyspnea or hemodynamic instability such as tachycardia. Larger PEs, which tend to lodge centrally, typically hypoxia, low blood pressure, fast heart rate, and fainting, but are often painless because there is no lung infarction due to collateral circulation. The standard presentation for pulmonary embolism with pleuritic pain, dyspnea and tachycardia are likely caused by a largely fragmented embolism causing both large and small PEs. The small PEs are frequently missed because they cause pleuritic pain unaided without any other results and large PEs often missed because they are painless and mimic. Respiratory diseases are the common and significant cause of illness and death worldwide. In the UK, nearly 1 in 7 individuals are affected by some type of chronic lung disease. People with the respiratory disease have difficulty respiration from a limitation in processing air out of lungs which further can cause emphysema and chronic bronchitis. The tissues and organs that make an exchange of gas probably in higher organisms, and includes conditions of the trachea, bronchi, upper respiratory tract, bronchioles, alveoli, pleura, and pleural cavity and the nerves and muscles of breathing occur in case of uncontrolled conditions. They are characterized by high inflammatory cell recruitment or destructive cycle of infection. Some of the most common are asthma, chronic obstructive pulmonary disease, pulmonary effusion. As CRDs are not remediable; however, various forms of treatment that help dilate major air passages and improve shortness of breath can help control symptoms and increase the quality of life for people with the diseases. Lung cancer is the major cause of cancer-related death worldwide. About 85% of cases are related to cigarette smoke and is a malignant tumor categorized by uncontrolled cell growth in tissues of lungs and rarely to other parts of the body. The cases are often caused by a combination of genetic factors and exposure to radon gas, second-hand smoke, asbestos or other forms of air pollution. Lung cancer may be seen on computed tomography and chest radiographs. Lung cancers are of two types, they grow and spread differently are small cell lung cancer and non-small cell lung cancers. The lungs are giant, the tumor grows in them for a prolonged time before they are found. Small-cell lung cancer represents about 15 to 20 %of lung cancers whereas Non-Small cell lung cancer represents about 80%. More than two-thirds of nonsmokers having lung cancer are women, and maximum of them posses adenocarcinoma. The general diagnosis of lung cancer is poor because doctors tend not to find the disease until it is at a progressive stage. The survival rate in five years is around 54% for early-stage lung cancer that is confined to the lungs, but only around 4% in advanced, inoperable lung cancer. In chronic pulmonary disease immune dysfunction occurs. Chronic inflammation contributes to lung damage, consists of innate and adaptive immune responses. extensive immune dysfunction due to the presence and functional activity of T regulatory cells, CD4+ exhausted effector T cells and myeloid-derived suppressor cells. Manipulation of these immunosuppressive networks in COPD could provide a rational strategy to restore functional immune responses, reduce exacerbations, and improve lung function. It facilitates the episodes of respiratory tract infections further proceeds to the pathological appearances of the disease. Inflammation is accompanied by the initiation of defective immune responses that subsidize to worsening the inflammatory lung and disease severity. Advanced approaches to adapt to immune responses could be useful in preventing the adverse consequences of most of the inflammatory reactions in the lungs. The epidemiological studies of chronic pulmonary disease to quantify the burden of COPD on society and to compare it with various diseases. It is the fourth main cause of death, the spread of the burden of COPD is and will remain a hot topic, as resources for any health intervention are always limited, and they need to be used carefully. Consequently, COPD is associated with a significant economic burden, including hospitalization, work absence, and disability. Existence rates for people with severe COPD and pulmonary disease are, in fact, worse than those for people with many common cancers. Cigarette smoking is the fundamental factor, but other factors play a major role in initiating and triggering COPD. Emphasis on the multi-dimensional nature of the problem and an attempt of as long as insight into probable de-bottlenecking to diminish the suffering and pain of millions of COPD patients. The medications of pulmonary obstructive disease mitigate the harmful effects that influence difficulty in breathing. The main purpose is to relieve symptoms, minimize the side effects, decrease the risk factors and promote the passage of air through airways into the lungs. Advanced medications that help open inflamed lung airways to breathe better and a new class of drugs minimize the risk of pulmonary fibrosis and other related diseases. Even for further progressive stages of the disease, operative therapy is accessible that can control symptoms, reduce your risk of complications and exacerbations, and improve the ability to lead an active life. Chronic obstructive pulmonary disease is most generous and is related to an anomalous inflammatory response of the lungs to harmful particles or gases also with prevention and airflow limitation. Public health programs mainly focus on prevention of tobacco use, reducing industrial exposure to chemicals, dust, other outdoor and indoor air pollutants. Early treatment and control of asthma may avoid the development of COPD. The objective of COPD prevention and management is to recover a patient’s functional status and quality of life by conserving optimal lung function, relieve from symptoms, pulmonary critical care and preventing the recurrence of exacerbations. Pulmonary hypertension is a type of high blood pressure that affects the arteries in the lungs and the right side of the heart. These are the serious conditions that become progressively worse and are sometimes fatal. These fluctuations can cause the walls of the arteries to become thick and stiff, and extra tissue may form. The blood vessels may also become inflamed and tight. The symptoms are characterized by chest pain, swelling in ankles, legs. Although some forms of pulmonary hypertension aren't curable, treatment can help lessen symptoms and improve the quality of life. Moreover, pregnancy may have serious threats for women with pulmonary hypertension, so be sure to discuss birth control options with the physician. The circumstances of the obstructive pulmonary disease can be prevented by decreasing contact with risk factors. It includes decreasing rates of smoking and improving indoor and outdoor air quality. Regardless of frequent medical treatments, surgery may be measured for the symptomatic patient with medically-optimized, end-stage COPD. Effective management of COPD is based on the ability to slow disease progression, prevent infection, and treat reversible symptoms. If the scope of disease is not completely unalterable (end-stage), its progression can be decelerated through smoking reduction and decrease exposure to environmental pollutants or occupational irritants, and long-term therapy with supplemental oxygen. Several agents are available for the management of reversible bronchospasm associated with COPD. People having advanced chronic pulmonary conditions undergo several treatments like bronchoscopy. The goal of surgical interventions and therapy of chronic lung disease is to prolong life by preventing secondary complications, to relieve dyspnea, and to enhance the quality of life by improving functional status. COPD is a slowly progressive condition characterized by airflow limitation, which is largely irreversible. It is characterized and defined by the limitation of expiratory airflow. The current scenario is chronic airflow limitation results from an abnormal inflammatory response to inhaled particles and gases in the lung. The inflammatory mediators, including oxidants and proteases, are believed to play a major role in causing lung injury. Pathogenesis of COPD-an imbalance between proteases and antiproteases and an imbalance between oxidants and oxidative stress in the lungs. The pathological process of chronic lung disease is based on the concept that pulmonary diseases involve stages of commencement by pollutants, infectious agents and exposure to smoke, consolidation, and progression. Tissue damage involves complex interactions among oxidative stress, chronic inflammation, extracellular matrix proteolysis, and apoptotic and autophagic cell death. Chronic pulmonary disorder is a major risk factor of children’s death. Series of studies on pediatric pulmonary disorder indicates overlapping age groups from birth to late middle age that early life event which includes antenatal influences on lung growth and programs the child at increased risk for future COPD. Various signs are phlegm production, chronic cough, frequent lung infections, and difficulty doing daily activities because of breathlessness. Pediatric pulmonology is based on diagnosis, treatment, and accomplish children from birth to 21 years old with breathing and lung diseases. The COPD disorders in infants like pneumonia, asthma, tuberculosis, complicated chest infections are cured pediatric pulmonologists. ME Conferences is glad to invite you to the upcoming 9th International Conference on Chronic Obstructive Pulmonary Disease (COPD) planned to be held in the beautifully crafted city Helsinki, Finland during October 24-25, 2019. The conference emphasizes the theme “Scrutinizing the challenges and developing novel approaches for COPD treatment”. COPD CONGRESS 2019 welcomes the innovative strategies in the area of COPD research and also proposes a unique opportunity for the explorers from all over the world to gather, share and perceive new scientific interactions upon the various perceptions of COPD. Conference Series Ltd organizes 600+ Conferences every year across USA, Europe & Asia with support from 1000 more scientific societies and Publishes 400+ Open access journals which contain over 30000 eminent personalities, reputed scientists as editorial board members. According to the global COPD market research was estimated to be assets of $11.3 billion and, the prediction to scope value of $15.6 billion by 2019. The rapid growth of the pulmonary disease will be driven by a great number of new, more suitable and effectual yields entering the market and imposing greater value compared to the remedies that are already available in the market. Daily once LABA/LAMA, fixed-dose combinations of drugs (QVA-149) are now driving the growth of this disease. Global Smart Inhalers Market is dignified to rise at a CAGR of about 64.5% over the next decade to extend approximately $854 million by 2025. According to the current research, Global Asthma and COPD Therapies market shares in coming years is expected to be increased by the percentage. As now the US is the highest developing therapeutics for chronic respiratory disorders is 40% all over the world. Over the million deaths worldwide, more than half (54%) were due to the top 10 causes. Ischaemic heart disease and stroke are the world’s biggest killers, another main reason accounting for death is Chronic Obstructive Pulmonary Disease. These diseases have remained the leading causes of death globally in the last 15 years. 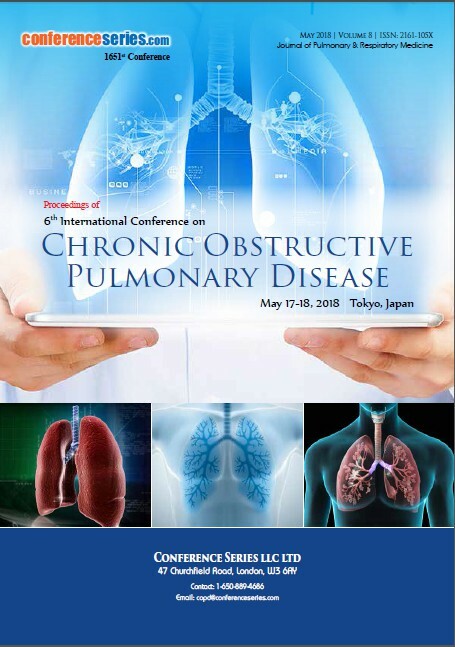 Conference series LLC Ltd successfully hosted for "6th International conference on Chronic obstructive pulmonary disease" during May 17-18, 2018, Tokyo, Japan. COPD 2018 conference was organized around the theme "COPD Today: Clinical and Research Issues" and it was a great success where eminent keynote speakers from various reputed organizations made their resplendent presence and addressed the gathering. With the feedback from the participants and supporters of COPD 2018, Conference series LLC Ltd is glad to announce 9th International Conference on Chronic Obstructive Pulmonary Disease (COPD) during October 24-25, 2019 in Helsinki, Finland. COPD Congress 2019 will cover some of the most challenging topics and advancements in research in the fields of Pulmonary and Respiratory medicine.